Samsung Electronics Co.'s $8 billion agreement to buy Harman International Industries Inc. helped breathe some life into a few moribund auto stocks, especially Visteon Corp., as investors speculate that there could be a buying spree of companies that make technology for self-driving cars. Visteon's shares have surged about 16 percent this week after falling 39 percent this year through Nov. 11, the last trading day before Samsung announced the Harman deal. Much-larger Delphi Automotive and Mobileye, which both make technologies for self-driving cars or driver infotainment, saw their stocks rise more than 2 percent the day of the deal. The bet is that with Samsung plowing into auto technology, perhaps smartphone rival Apple or other tech giants could do the same. Even without a fresh round of dealmaking, the 28 percent premium paid by Samsung could get investors to rethink the depressed values of some auto suppliers, whose shares are collectively down 6 percent this year. "We see this transaction as a watershed event with significance across the global sector that could re-rate the group," Morgan Stanley analyst Adam Jonas wrote in a research report. "From this day forward, we believe investors looking at automotive and automotive supplier stocks will ask 'what's the next Samsung-Harman?' and with good reason." Visteon looks the most likely company to be bought for several reasons, said Richard Hilgert, a Morningstar Inc. analyst. With a market capitalization of $2.7 billion, it would be far easier for a buyer to swallow than Delphi, which is valued at about $18 billion, and Mobileye with a valuation of more than $8 billion. 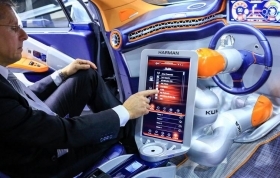 The enthusiasm hasn't just been limited to companies focused on automotive electronics. The Bloomberg Americas Auto Parts & Equipment index has risen 3.6 percent this week through Nov. 17, more than triple the Standard & Poor's 500 stock index. Among more traditional parts-makers that gained this week are American Axle & Manufacturing Holdings, up about 14 percent, and seatmaker Adient Plc, which has gained about 15 percent. Hilgert said Visteon is enticing because it's some ways a smaller version of Harman: It makes technology in the dashboard like electronic displays, telematics and infotainment systems, and it it has expertise on interfaces between humans and machines. The company is also developing technology for self-driving cars. Jim Fisher, a spokesman for Visteon, declined to comment on speculation about whether the company could be sold. Jerusalem-based Mobileye didn't immediately respond to a request for comment. Today's Visteon is a long throw from the former Ford parts business that was spun out in 2000 and reorganized under Chapter 11 bankruptcy protection in 2009. The company based in suburban Detroit has slowly winnowed itself down to focus on connected-car technology and electronics, with the final move coming through the 2015 sale of its air conditioning business to to South Korea's Hankook Tire Co. If Samsung's rivals want to get in the game, Delphi could also be a target, Robert W. Baird & Co. analyst David Leiker said in a research note after the Harman deal was announced. Delphi has a joint venture with Mobileye to develop a cost-effective self-driving vehicle systems and is a big player in making infotainment systems. But like a lot of the players in automotive technology, Delphi doesn't make every piece needed for self-driving cars. That's why the company partnered with Mobileye for its autonomous vehicle system, said Jeffrey Owens, Delphi's chief technology officer, in an interview. "We've got a great portfolio and we've got a great management team that's willing to invest to solve the next cycle of trends," Owens said. "If somebody saw that as an advantage, we'd deal with that at the time it happens." Delphi's sheer size would still make if difficult to buy, Hilgert said, adding that the company also makes some lower-tech electronics systems that an acquirer might not want. Mobileye has already attracted interest from carmakers because it makes mapping technology and vision sensors that allows self-driving cars to see the road and know where to go. General Motors, BMW Group and Volkswagen Group all work with Mobileye, along with more than 20 others, the company said on a February earnings call. At a market value of about $8.5 billion, it would be much easier to acquire than Delphi. The problem, Hilgert said, is that founders Ziv Aviram, who is CEO, and Chairman Amnon Shashua own 9 percent together. They see revenue growing from an estimate of $350 million this year to $1.1 billion in 2019 and would be hesitant to sell before they realize the company’s growth potential. Major suppliers such as Germany's Robert Bosch, ZF Freidrichshafen and Continental could also start looking to build out their technology businesses. Samsung rivals such as Japan's Panasonic Corp. and Korea's LG Electronics Inc. could also get interested. The attraction, analyst Jonas said, is that the tech giants may see the world as one where smartphone demand has peaked, while "the vast untapped automotive/mobility markets will continue for some time."